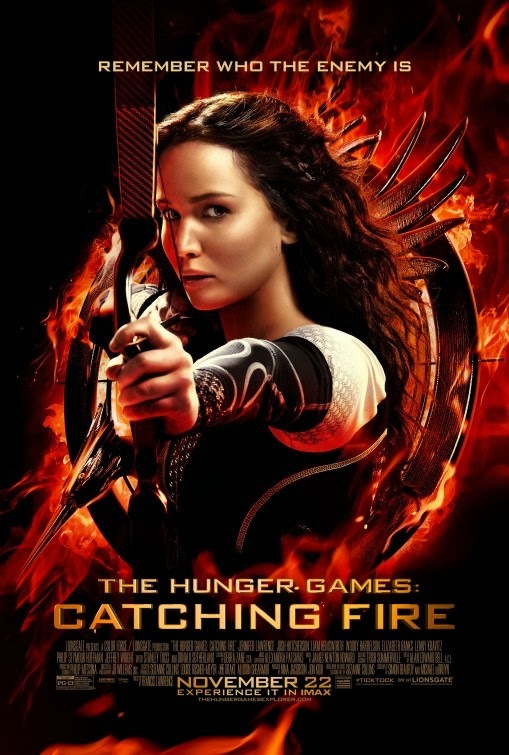 THE HUNGER GAMES: CATCHING FIRE begins in media res, assuming wisely that we've all watched the first movie if not read the wildly popular books. We're in a harsh dystopian future where fascists keep the masses in penury, fobbing them off with glitzy super-violent reality TV. Our heroine, Katniss Everdeen (Jennifer Lawrence) is back from the Hunger Games of the first movie, struggling to explain her faked on-screen romance with fellow survivor Peeta (Josh Hutcherson) to her home-town love-interest Gale (Liam Hemsworth.) But this nascent and hackneyed love triangle is rightly cut short by larger political dangers. The evil President Snow (Donald Sutherland) fears that Katniss has become a symbol of defiance and, when she can't convince him or the crowds that she's an obliging mouthpiece of his regime, he orchestrates a Hunger Games in which she will once again have to compete for her life. The catch is that she will compete against those she cares for - Peeta and their mentor, Hamitch (Woody Harrelson). What I love about The Hunger Games franchise is that while it does have a fair dollop of the typical teenage romance, it's given limited time and is handled with far more nuance than, say the Twilight franchise. Katniss is a strong woman - she isn't defined by her love interests - indeed, to Gale and Peeta's disappointment, she refuses to even acknowledge them. We understand that she loves both men in different ways - Gale as a symbol of the home he loves but Peeta as the man who can empathise with what she has been through since she left. And in an unusual twist on the typical romance, Katniss is the physically stronger of the two, whereas Peeta has the higher emotional intelligence. She may save him in the arena, but with his ruses to win the heart of the public, he saves her from the Capitol. Given this film's emphasis on the political fallout from Katniss victory in the first film, and lesser time spent on the actual gladiatorial contest, I far prefer it to the original. I love seeing the dystopian world-building - the rich art direction - the beautiful costumes - the stark depiction of poverty. More importantly, I love the satire on contemporary reality culture, and the sinister edge that Stanley Tucci's gamehost, Caesar Flickerman, lends to what most would leave as just a comic performance. There's something truly unnerving about his forced laugh and day-glo teeth. But for me the real scene-stealer is Elizabeth Banks as Katniss and Peeta's stylist, Effie. As in the first movie, Banks has to sport the most outlandish costumes and toe the party line on being fabulous-dahling but in this movie, she gets to show the real heart beneath the wigs, while all the time pretending to still believe in the system. It's a marvellous portrayal. As usual, I had less time from the games in the arena, which always seem like a series of levelling up quests followed by a tricksy ending. There's nothing to match the death of Rue in the original. There are some new characters, all rather banal, and poor Jena Malone's over-acts fiercely as the angry Johanna Mason. Most fascinating is the casting of my acting hero, Philip Seymour Hoffman as Plutarch Heavensbee, the new gamesmaker. For most of the film, Hoffman is so anonymous as to almost look like he's in a different movie, or phoning it in. I leave you to decide whether, given the final act, this is a clever choice or just lazy. Overall, the best way to describe the movie is professional and faithful. Taking over from writer-director Gary Ross, we have Francis Lawrence in the director's chair and Simon Beaufoy and Michael Arndt writing the script. I could discern little difference - we still get a movie with rich production design, solid to excellent performances and a fascinating political plot. Indeed my only real criticism of its direction and script is the rather underwhelming final shot - that said, this is probably faithful to the book. THE HUNGER GAMES: CATCHING FIRE is on global release. The film has a running time of 146 minutes and is rated PG-13.